Day 23. We leave Johannesburg in the morning to fly to one of the world’s most dramatic sights – the legendary Victoria Falls on the Zambesi River. 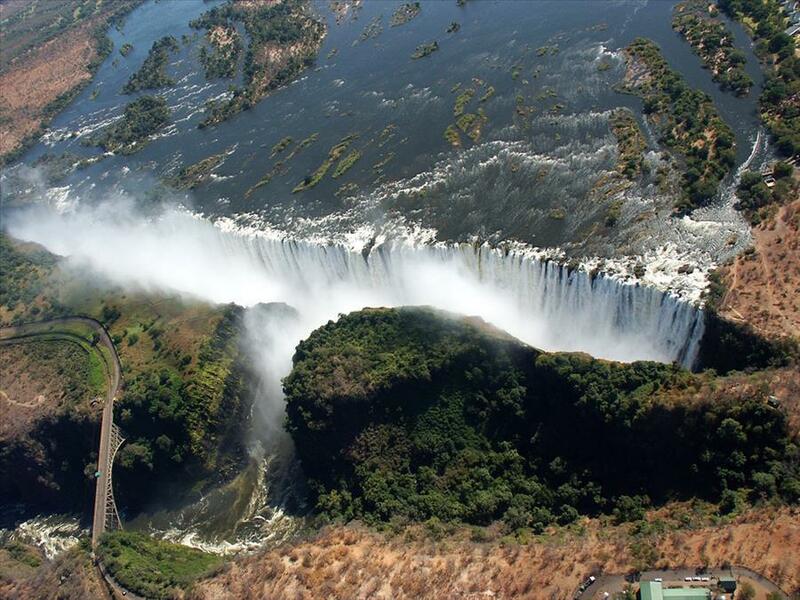 We will be met upon arrival at the Victoria Falls Airport, in Zimbabwe, for transfer to the River Lodge Hotel, and spend the afternoon viewing the extraordinary phenomenon that is “The Falls”. Days 24, 25, & 26. 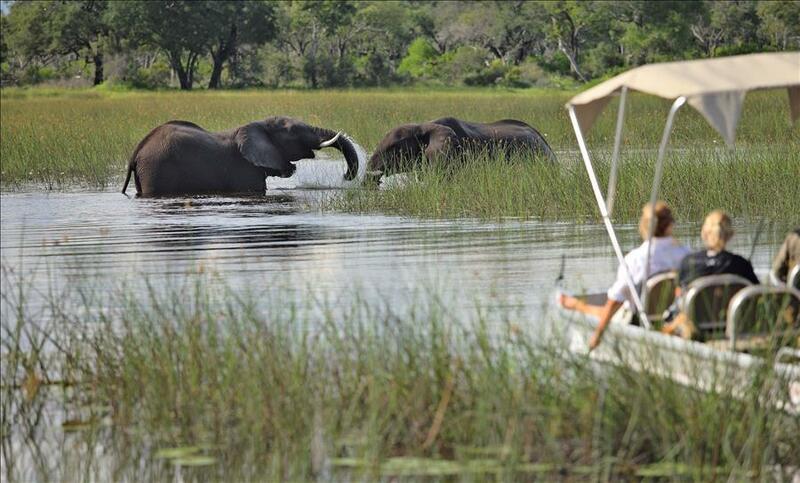 The following day, the Okavanga Delta beckons! A maze of lazy lagoons, meandering channels and overgrown islands teeming with wildlife, Botswana’s Okavango Delta lies like a sparkling jewel at the heart of the Kalahari Desert. Known as “the river that never finds the sea”, its crystal clear channels spread over the thirsty lands of the Kalahari with their papyrus-fringed banks and fertile floating islands. Adapted for a life in and out of water, the elegant antelopes – the red lechwe and shy sitatunga – are found in this watery wilderness. Lion, cheetah, leopard and African wild dog share the floodplains with large herds of elephant and buffalo. Hippo inhabit the deeper channels and lagoons, while honey badgers can be seen in broad daylight. Tall termite mounds are homes for families of dwarf and banded mongoose. Glide through the glistening waterways in a mokoro (dugout canoe), where iridescent dragonflies, frogs of every colour and jewel-like kingfishers live in the papyrus-lined banks. 593 species of birds exist in Botswana; you will see quite a few of them! 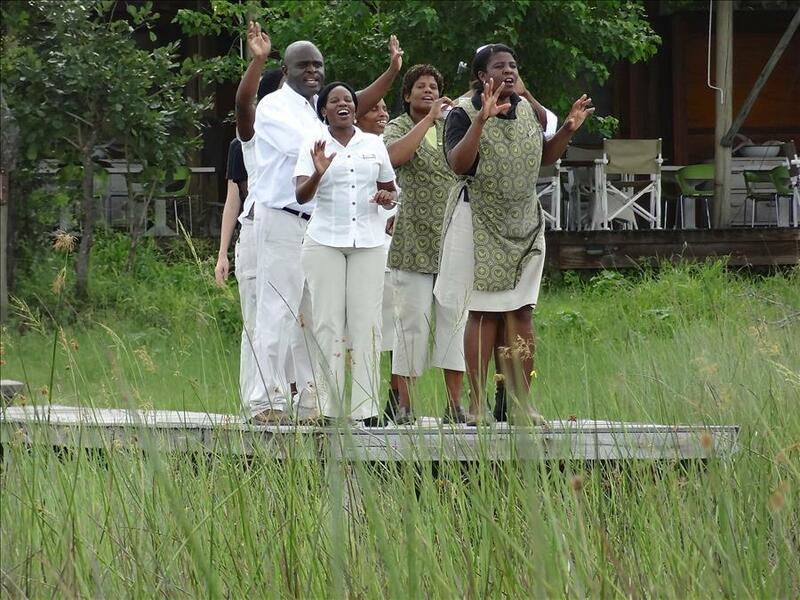 We will fly to the airstrip with the delightful name of “Pom Pom” in the middle of the Delta, where we will be picked up by the team from the AndBeyond Xaranna Okavango Delta Camp. “And Beyond” is one of the world’s foremost tourism conservation organisations; catering to the luxury market, it has done invaluable work in many countries in Africa and Asia. We will have 3 nights in a safari tent with en-suite bathroom, sala and private plunge pool. Your days will be devoted to seeing wild animals by land and by water, while falling under the friendly spell of the attentive and well–trained staff. Days 27, 28, & 29. Positioned within an exclusive 25,000 hectare wilderness concession, &Beyond Xaranna Okavango Delta Camp boasts breath-taking views out over a permanent channel of the Okavango Delta. The overall atmosphere of the Camp is light and airy in keeping with this pristine setting. The nine en-suite safari tents are organic in design with a combination of canvas and bleached timber, delicately decorated in shades of fatigue (khaki) and soft lily pink. Each tent boasts a romantic sala, private plunge pool, indoor bathtub and al fresco shower. The guest areas are all positioned carefully to maximise the sweeping views out across the channels. The intimate guest sitting area boasts a spacious reading area, perfect for afternoon relaxation. The elevated dining area features shady verandas with mesmerising views leading out onto an open air “boma”, where exotic candlelit dinners are served under the stars. A fully-stocked Safari Shop offers chic safari gear, African art and jewellery. After three nights at Xaranna, we will return to “Pom Pom” and fly for just 15 minutes to the Chitabi airstrip to obtain a different perspective on this amazing area at the just completely rebuilt AndBeyond Sandibe Safari Lodge, an earthy yet glamorous safari lodge situated on a permanent channel of the Okavango Delta, adjacent to the Moremi Game Reserve. Drawing its inspiration from nature, the lodge blends into the landscape, providing an experience that is serene, earthy and organic. Secluded plunge pools and outdoor showers in each of the fifteen suites allow guests to feel part of the forest, while private fireplaces warm the African nights once the sun goes down. Cleverly constructed indoor and outdoor lounging places create cosy nooks ideal for private dining beneath the stars. An interactive kitchen and interpretive naturalist library encourage guests to become one with the surroundings and to enjoy every aspect of the Delta experience. 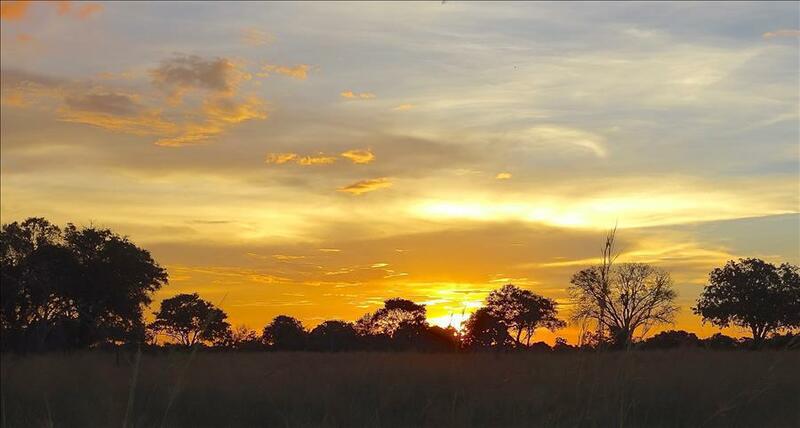 &Beyond Sandibe Okavango Safari Lodge has exclusive traversing rights over 270 km2 of wilderness in a private concession, the site having been specifically chosen for its extraordinary beauty and proximity to the game-rich grassy plains. &Beyond Sandibe’s raised guest areas and suites look out onto the Santantadibe Channel, providing spectacular Okavango Delta views. Day 30. We will fly from the Chitaba airstrip to Maun, in the centre of the country, where we will join a commercial flight to Johannesburg, There, we will doff our safari clothes, shake off the dust and burrs of the bush, and in the lovely surroundings of the Fairlawns Boutique Hotel & Spa, have a Farewell Dinner celebrating the extraordinary and unique experiences of Africa that we will have enjoyed. The formal part of the trip ends after a hearty breakfast the next day. Most guests will be departing that evening for their international destinations. Note that the group will consist of between 8 and 12 people, including the Doulls. We reserve the right to alter some of the above schedule where we consider it appropriate. Note: If there is interest in a trip to Namibia following the above, we would be happy to organize that too.